Predict next date - when milk prices will be hiked ! 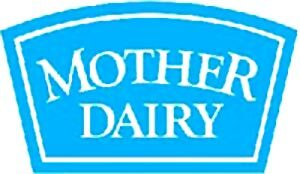 Just count FOUR months & revise the prices of Milk. It has become a routine. February 2010, July 2010, December 2010 & now last day of April 2011. You can check the time difference of appx. FOUR months which shows a PATTERN & not the necessity to revise the prices. One can follow this pattern & predict that now the prices will be revised in SEPTEMBER 2011. And the impact, budget of every house hold is revised. Even the Rikshaw wala will ask high. Is there no Check ? माँ गुजर चुकी हैं पापा दारू पीकर पड़ा रहता हैं बड़ा भाई और उसका दोस्त काम करवाते हैं पूछने पर बताया कि भाई भी कूड़ा बीनता हैं और इस पैसे से चीज खायेंगे पापा कुछ काम नहीं करते.और हमारी कालोनी में बहुत सारे बच्चे इस तरह का काम करते हैं. जिससे चरम रोग, कुपोषण, लीवर जैसी बीमारिया सभी को हो रखी हैं . अगर सरकार चाहे तो इन बच्चो के उत्थान के लिए काफी कुछ कर सकती हैं. I don't know what happened to the FIR registered against the office bearers of the concerned RWA in the Noida sisters death case. The MCD guidelines for installation of security gates hold the RWA office bearers accountable and responsible on account of non-functioning of iron security gates in their respective colonies (item 3.q); and now, I don't know how they (govt.) would treat the volunteers nominated by the RWAs to assist the govt officials in issuing the Unique ID cards. A few days back, on this blog I suggested as to how long we would continue to quietly accept all this. It is time that the Joint Front take up the issue of empowerment of RWAs at the CM level. If someone does not pay the property tax, you threaten to confiscate the property; what can the RWAs do if residents don't pay their subscriptions or co-operate in many other ways? Nothing! But what's about Talkatora Gardens play ground ? But what's about Play grounds in the Talkatora Garden ? Talkatora Garden Play Grounds, under NDMC, have been destroyed and a small play ground-portion left is now under lock and key and NOT allowed to play Foot Ball and Hockey at all ? NDMC Chairman, who has ordered this closer, as per watchmen, may not be knowing that in 1950- 60s-70s there were 2 Full size Football Grounds, 2 Full size Hockey Grounds and in the Corner of Hockey Grounds a small practice Pitch for Cricket was there and more than 100 players use to play there only every day in the evenings and on Sundays too. Veteran Foot Ball Players, have been playing on these grounds since 1960, The list of National and International Football players, shall be too long to mention; were produced from These grounds only and now we just play for Not more than 2 Hours at 7.30 AM to 9.30 AM on SUNDAYS only BUT the NDMC Garden- employees call PCR every Sunday to push us out of Ground ?? Many School/College players those who come and play with us as they get free coaching as well as get a good chance to play with National/ State Football players too are bitter with this NDMC order. My question is who knows Talkatora Garden batter than us ? and we also know that what other activities were/ are going on there since ages and there is no body to stop those activities but the players who's presence in the play ground only means disturbance to those visitors activities ? Thus players are not allowed to play. Where from our Hockey and Football players shall be produced ? we have made a representation to Mr. Makan at his residence last Saturday only, should we go to Hon'bl High Court for this matter ? Do we have a RIGHT to PLAY ? Today at 5pm the meeting to discuss whether trifurcation of MCD is useful for delhi citizens or not. The meeting was attended by DELHI MAYOR ARTI MEHRA, SH KEDAR NATH SAWHNEY SH.KISHOR AND other wellknown dignitaries. They made forceful speeches to highe light advantage and disadvantages of trifurcation of MCD. I also spoke that whether in existing shape or aftertrifurcation, it will depend on integrity of persons heading such units. MCD HAS totally failed to collect legimate revenue from property tax and mobile towers regularisation. Horticulture is in bad shape as against three mails posted only one is reporting. TWO OTHERS APPEAR TO BE GHOST EMPLOYEE. HIGH MAST LIGHTS IN PARKS PROVIDED OUT OF COUNCILLOR FUND HAVE BEEN DISFUNCTIONAL FOR THE LAST ONE YEAR. PLEADINGS WITH AREA COUNCILLOR HAS NOT BROUGHT ANY RELIEF. So, how does it matter if work culture does not change. Itbis ultimately the rwas and joint front who have to come forward and build up pressure till situation approves. NEW DELHI: In a significant ruling for children in the city who are constantly being shooed away from parks by resident welfare associations,Delhi high court has said that no one can prohibit children from using a park as a playground. Rejecting a plea by a city RWA opposing fencing of a section of a local park by MCD (so that it can be reserved for volleyball), Justice Rajiv Sahai Endlaw on Tuesday invoked Oscar Wilde to drive his point home. "I find that the petitioners (Rajinder Nagar Welfare Association) by intending to prevent children and adults from playing in the park are acting like the 'selfish giant'. They forget that a park without having children and adults to play there can't bloom. In response to your below said mail, we wish to enumerate only the major and urgent civic problems which have not been responded at all by the authorities concerned so far. We wonder your channel of communication could resolve the outstanding problems, we would welcome it with abundance of appreciation and gratitude, which we will publicly acknowledge! 1. Cleaning of storm water drains throughout the colony which have become a fertile place for breeding of mosquitoes. 2. Dog menace - Daily a few cases of dogs' biting taking place with enormous suffering and expenditure. This is growing in abundance with no solution! 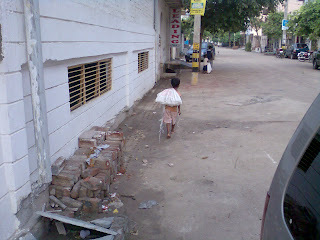 Some time we wonder whether we are living in a remote village or in the heart of a mega city - the capital of India. 3. Repairing/relaying of service lanes and main and inner roads in the colony which are in a very bad shape. 4.Encroachments are not being removed at all to facilitate parking of vehicles i.e kitchen gardens, ramps etc. 6. Replacing the water pipe and sewerage lines - getting worn out as they were laid more than 3 decades back. On all the above items an innumerable of letters and memoranda had been sent to all the authorities concerned and brought to personal notice of our representatives i.e. Councillor and MLA but no effect at all! Who would care and resolve the problems? Can the East Front arrange to solve them? We will wait and watch!? Plz click & click on the image to view it properly. Subject : Request to restore proper water suppry to the residents of Mandir wari Gali, Village Kapashera. I' on behalf of Executive committee of Gramin uthan Avm Jan Kalyan Samiti, Kapashera' New Delhi - 110037 would like to bring to your kind notice that the residents of Mandir wali Gali of village Kapashera and not getting water regularly since last six months. This problem has brought to the notice of Mr. T.P. Singh, who has visited the site and assured to restore regular water supply. 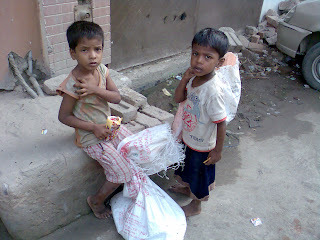 These residents depend on Bore well located near Sabji Mandi (Delhi Jal Board office) and in Mandir premises. These Borewells are arso catering water to Harizan basti in addition on other Bore well located near Harizan choupal from which this Mohalla is also getting water. we would like to suggest that these both Sabji Mandi and Shiv mandir Bore is connected to Mandir Wali Gali for direct supply. This may kindly be considered in priority. It is inform you that the outlet Nalis of this Colony is full of dirty blackish water and garbage and also dirty water is flowing on the road, Causing increasing of mosquito’s breeding which my leads to spread of Malarias and Dengue like fever. Also inform that the no any representative of Health Department is visiting frequently in this locality due to which chidren as well as many people are suffering from fever. There's a major mosquito breeding which is happening near our surroundings due to garbage dump..
Kindly do something urgently otherwise it will lead to major epidemic like Malaria...Pls arrange for the Pesticides spray in our appts & our area as it's almost impossible to walk in our area post 6 pm in the evening. Therefore we request to please arrange for cleaning these nalis to avoid the spread of Mosquito and direct officials to spray anti malarial medicines to stop such breeding with immediate effect.. This will help in not spreading of Malaria & Dengue in future. 1. The Mayor, MCD, Chandni Chowk, Delhi. 2. MLA Burari-02 , Delhi. 3. Dy. commissioner Civil Line zone. Delhi. As per our records a large number of SUBSCRIBERS of our RWABhagidari blog, are not yet getting our absolutely Free News letter. Please note that, after subscribing the blog, you get an automated VERIFICATION mail to check that it's you, who had subscribed the blog. You have to open that mail & click on the CONFIRMATION Link to start getting our Free News Letter. Therefore, if you had subscribed the blog & not yet getting the regular updates, please log on to www.RWABhagidari.blogspot.com & RE SUBSCRIBE the blog as above. NEW DELHI: A day after facing the opposition's stinging attack on her government's involvement in the "bungling" of the Commonwealth Games(CWG), Delhi chief minister Sheila Dikshit on Tuesday attacked the BJP for "jumping the gun" and said "we will come out clean". "How can you lap up whatever the opposition says or alleges. Why does it (BJP) not say anything against (former Gujarat minister) Amit Shah and (Karnataka chief minister) BS Yeddyurappa who are indulged in corruption. Let the enquiry take its own course and we will come out clean," Dikshit said on the sidelines of a Women's Car Rally. Following the arrest of former CWG chief Suresh Kalmadi for alleged irregularities in the granting of contracts for works related to the October 2010 sporting event, the Bharatiya Janta Party (BJP) on Monday said that Kalmadi's arrest is just "the tip of the iceberg" and stringent action must be taken against Delhi government which is also involved in the bungling of the Games. We must firm up our views regarding tariff enhancement by BSES. Point is who is paying for stolen energy ? Now since electronic meters have been installed, why stolen units are 55 to 65percent. Customers are being made to pay for inefficiency of bses. Mail us now if u have any civic problems ? If you have any Civic Problems & want to share with us, please feel free to mail us. We will visit you ( presently in Delhi East only ) to understand your civic problems & will take PICS / VIDS / INTERVIEW & will upload on this blog so that the issue is highlighted to its maximum. If you are from any other part of Delhi, please feel free to mail us in detail about your real civic problems with supporting pics for uploading on the blog. Yesterday, we visited Anand Vihar DDA Flats area to understand the problems of the residents. This part of the Anand Vihar is on the lower end and as a result, heavy water logging during rains is a major problem. An old lady of 80 yrs complained that in last rains, water covered her bed & there was none to help her. A young girl informed that three days ago her father caught a long snake and shivered while narrating the incident. Parks have become parking lots with cars inside instead of plants & flowers. A big drain adjoining the locality was covered some ten years ago saying it a green belt but no proper Green belt is yet visible. The Sewarage system has collapsed as the flow was reversed after covering the drain as above. A Lady took us to a corner of the locality where in a deep cavity, dirty & filthy water was filled & dogs were playing in that. It smelled so bad that we had to run away. Mosquittos were visible in bulk at that corner. The piped gas is being supplied in Anand Vihar but for these DDA flats residents, the company has refused the connection even after a good number of residents deposited requisite amount. NOW THEY SEND ME LETTER THAT WE HAD TEMPERD METER AND ACCUSE ME FOR THEFT. AS MY METER SEALS ARE PERFECT AND IT IS ELECTRONIC METER HOW CAN WE NOW OF DATE CHANGE AND HOW CAN WE DO THEFT WITHOUT TEMPRING METER .IT IS IC OPRATED ELECTRONIC METER THERE ARE 100% CHANCE OF INTERNAL FAULT ,ONE CAN DO NOTHING IN METER WITHOUT OPENING IT . SO PLZ GUIDE ME A WAY HOW CAN I COME OUT OF THIS FALSE ALLEGATION IMPLANT AGAINGT ME. The government's proposal to tax residents to arrange funds for expansion of the Delhi metro hasn't gone down well with the people. Residents said the argument that the value of a property goes up and quality of life improves in areas with metro connectivity is highly misplaced and does not hold truin most areas. More often than not, residents added, proximity to metro stations leads to nuisance and chaos. "Thanks to the metro station next door, there is lot of nuisance around my house all the time. Rickshaws and autos cause traffic snarls and there are unknown people moving around all the time making us feel insecure," said Sudhir Kakkar, a resident of Rohini Sector 13. While the government is working on a plan to levy additional property tax and betterment tax on properties along the proposed metro corridors in phase 3, the municipal valuation committee has also prepared a report on re-categorisation of residential colonies and upgrade those that fall within half-a-kilometre of a metro line. 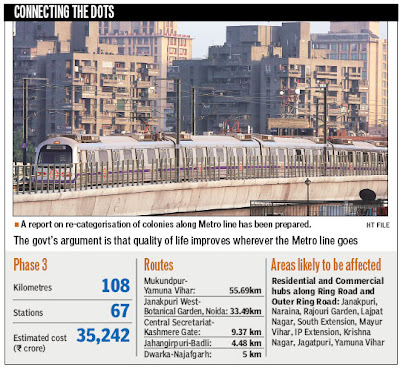 "If increased property tax is the price we will have to pay for a metro line near our houses then we don't want metro corridors anywhere near our house," said RK Jain, a resident of Krishna Nagar, which is likely to be connected by metro in phase 3. We will try our best to upload the civic problems being faced by the RWAs / Residents covering Entire Delhi & NCR. Therefore, please feel free to mail us your civic issues with pics & vids BUT with your complete contact details i.e. Name, Address, Cell number, Land line number, Mail ID etc. 1. Last 2 months bus parked in front of Shivalik. 2. last one month malba are near the Bus stand. 3. No cleanness near the Bus stand. 4. Last year in Shivalik 20 cases was dengue. 5. no cleaness of the drainage. 6. No - out fall of the drainage. My request pl. help us &do the needful. 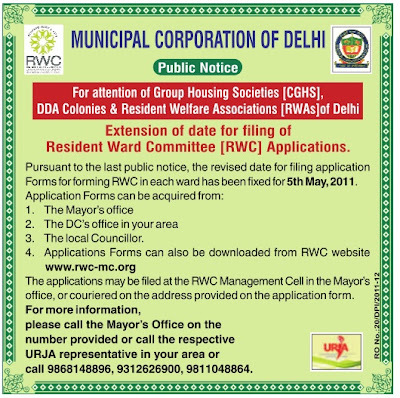 New Delhi, Apr 19 (PTI) The MCD has extended by two more weeks the last date for residents welfare associations to nominate a representative each to ensure formation of residents ward committees, which will work as consultative bodies for local-level development. The corporation had announced the scheme for constituting residents ward committees (RWCs) on March 10 and said it will boost public participation in civic decision-making. "We are extending the last date from April 15 to April 29 to facilitate cooperative group housing societies and DDA societies, which are also part of the scheme but had sought some clarifications. We have received applications from 700 RWAs," Mayor P R Sawhney told reporters. He said the process of formation can start and those who apply later will be accommodated gradually. As per plan, the RWCs will comprise a representative from each registered residents welfare association within a municipal ward, apart from the area junior engineer (works), sanitary inspector and section officer (horticulture). The councillors will chair the committees. The MCD had issued a public notice for commencement of the scheme and said the RWAs can send a letter of nomination along with application for registration to the Chief Coordinator of RWC Management Cell under the Mayor's office. Sawhney said though most of the municipal councillors involve RWAs while deciding on development works in their areas, the new panels will "institutionalise" this system. The panels will meet once a month and give suggestions on development plans and help prioritise their needs. 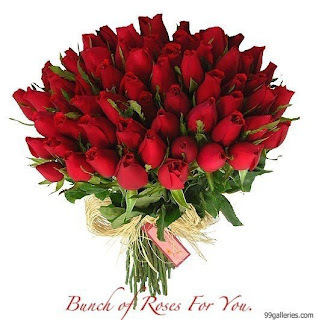 Please accept my Best Wishes for " Registration in Societies Act ". Well began is Half Done ! When 'congratulations' are pouring and showering on you, mine will be insignificant. Notwithstanding, it is a major step to go forward and look ahead. Registration of the Front is no doubt an important landmark but however, redressal of grievances of the RWAs which are mounting up will be a mega achievement which will acclaimed by one and all. Let's pay our attention on this and march ahead. Under your inspiring leadership spearheading the movement, this could be achieved if all cooperate with you and stand in unison to solve all our major problems which cannot any longer belittled! All those who believe in social work and self less service shall naturally be happy and offer boque to vohra ji our leader. I am in Max hospital since 14th april due to age related problems, so my personal appology for not coming in person to greet him. Now perhaps our next goal is to be member of team delhi and bhagidar as a representative of the front. Some time , we wish to speed up things but things when these have to. Anna worked as a crusader for decades, got several cases registered in this struggle but now the stage has finally been set for drafting of LOKPAL BIL. So, my friends...we are on the right track and i pat myself that in the first general body meet of our blog, i proposed Vohra ji as President. The choice was unanimous with thundering applause. Societies Registration Act of 1860. We must do something to generate awareness on this issue. Why to blame the RWA ? Mr. Gupta is right. The RWAs are toothless under the current dispensation. Even if they were empowered, it would be absurd to assume that they would go snooping around! Mr Jeet Kumar of Mayur Vihar has very rightly asked the authorities to explain as to why the RWA has been held responsible and FIR lodged against the office bearers in the Noida sisters' death case. Yes, what admin/judicial authority the RWA has to peep into one's personal affairs. If the RWA had done something, the same NGO would have asked - who is RWA to interfere in someone's personal affairs? Similarly, the MCD guidelines for installation of iron security gates in colonies, hold the RWA office bearers responsible for any mishap due to non-functioning of iron gates. And, surprisingly everyone has been quiet, or in other words, accepts the responsibility. 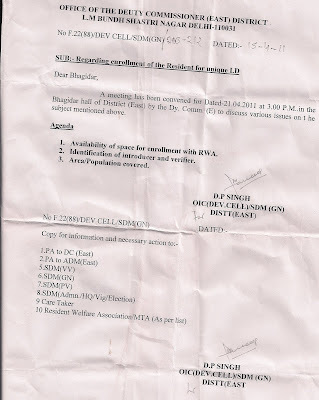 The Priydarshini Vihar RWA has raised the issue of empowerment of RWAs with the MCD on various occasions, and also also sent letters asking them either to empower RWAs to collect subscriptions from all the residents and take other appropriate decisions for the welfare of the residents; or withdraw Clause 3.q) from its Guidelines issued on 30/06/2007. The issue of empowerment of RWAs has also been raised by us and several other RWAs, at several meetings with the CM. I think, it is time, the Joint Front take the lead and fight for empowerment of RWAs. This Association takes the opportunity to encroach up on your valuable time and draw your kind attention towards the difficulties experienced by the Residents of Keshav Nagar, Burari- Road, Delhi-110036 due to in adequate street lights. In this Colony total no of 230 Poles have been provided by only but only about 70 poles are with lights as a result of which most area of the Colony remains under darkness. In the recent past there have been many instances of theft in the houses and the dark areas have become the favorable places for unsocial activities and crime. This Association therefore request you good self is provide 150 no’s street lights in this Colony as early as possible. Enclosed please find the letter no. KNJKS/2010-2011/41 dated 08.01.2011 from RWA Keshav Nagar, Burari Road, Delhi which is self explanatory. The residents of Keshav Nagar, are really facing the problems due to inadequate lighting arrangements i.e street lights are badly needed in this colony. I would request you to kindly do the needful and oblige on behalf of this letter at the earliest. we seek your good offices to help us solving our problems with deferent agencies and authorities that Administer the city of delhi. Most of the problems relate to negligence on part of MCD , condition of roads, storm water drains, footpaths cleanliness are in poor state. portion of Roads which belong to PWD are bad ,protecting grill required on the road running along with Outer Ring Road is neccesity which is missing inspite many request. DDA has an adjecent park located at N-81A between our colony and neighbouring colony Shahpurjat is being missused by the neighbours by converting a park into parking lot and made part of it an open sewerage which stinks and breeding mosquitoes. The park is no more a park without any greenary .Our complaints about this park have folowen on deaf ears. The roads under PWD like August Krinti Marg and Outer Ring Road need pruning of trees as the street lighrs at many places are affected. Footover bridge on outer RIng Road is approved (28th meeting of sub-committee held on 06-112009 under the chaimanship of Pr. Secretary PWD) the work on this bridge shouls start. WHY ? Why the RWA is just blamed for every matter ? Will some one answer What is the Admistrative or Judicial power / Authority to the RWA office bearers ? For that matter what the NGO had done in this case who has roped RWA now? This is a very personal family matter, the girls are educated and their own real brother , who lives near by has not done any thing or the Police for that matter. What role RWA has in this family matter ? So, why blame RWA and not their Brother or Police ? 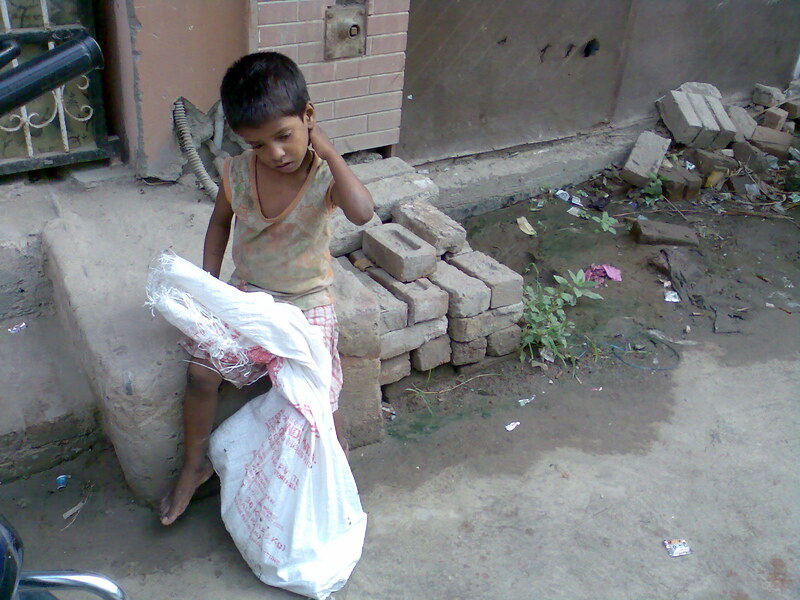 This is not justified to blame persons those who are rendering honerery Social work/ service to the residents. All the registered RWA should join to protest such an un justfied action by any one. The scope of this blog is also being extended & now onwards, we will upload the civic problems being faced by the RWAs covering Entire Delhi & NCR. Therefore, please feel free to mail us your civic issues with pics & vids but with your complete contact details. Labels: "MEGA RWA of DELHI", "VOICE OF DELHI"
NOIDA: Anuradha Behl's death has led to a blame game in Sector 29. While the RWA has alleged that even though its office-bearers had approached the police to take appropriate action in the case, the cops were reluctant to do anything, social activist Usha Thakur, who rescued the sisters, has registered a complaint with the Sector 20 police station against the RWA office-bearers . Her charge – that they allegedly came in the way of the rescue operation on Tuesday. Office-bearer RC Sharma alleged that the apathy of the police led to the incident. "We had approached the police a number of times. Four times we visited the police station but every time instead of taking any action, the police personnel came up with excuses. They did not even receive our complaint. We, being office-bearers , have no right to enter somebody's residence. We can only approach the administration to intervene if something is wrong," Sharma said. Thakur, who reached the Behls’ first-floor flat in Sector 29 along with police and a few members of her NGO on Tuesday, had jumped over on to the terrace and peeped inside. The neighbours said they did their bit, but the sisters denied them access and refused all help. They checked on them through Vinod Kumar, the man who supplied groceries to the sisters. They did not want to intrude beyond that. On Wednesday, Thakur registered an FIR against the Sector 29 RWA, claiming negligence. RWABhagidari blog was displayed by a PPT presentation at the Bhagidari Utsav 2011 in the DC East Stall. CONGRATULATIONS - TEAM INDIA !